This is one of the Zondervan “Counterpoints” books (2004). The editors take the latest forms of evangelical worship and have six different proponents defend each one and the others give a critique. The are: Formal-liturgical worship by Paul Zahl, an Episcopal rector; Traditional hymn-based worship by Harold Best, retired music professor from Wheaton College; Contemporary music-driven worship, by Joe Horness from Willow Creek; Charismatic Worship by Don Williams, a Vineyard pastor; Blended Worship by Robert Webber; and Emerging Worship by Sally Morgenthaler. Ironically the editors and some of the writers point out that the further down the list you go, the less that worship remains “new.” In those forms, it is almost impossible to “remain relevant” if that means being new and up to date. 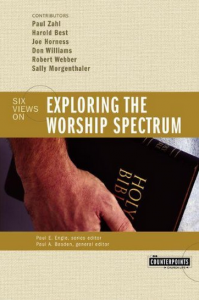 The reason I would recommend this book to interested people is because you get a concise definition of each kind of worship from a proponent of that view. I, of course, identified most with Harold Best although his ecumenical Wheaton wishy-washiness too often comes through, but more in his critiques than in his presentation. Even if you think you might like some of the formal-liturgical beliefs (I purposely don’t say “style”) you need to read of their devotion to the sacraments, the prayer book, and traditionalisms to know it is not you. Harold Best gives one of the best defenses of the hymn book that I have read. It is worth the price of the book alone. The further down the list you go, the more you will cringe at the outright contradiction to Scripture you will find. By the time you read of emerging worship you wonder if they have a Bible at all!